Shares of digital payments processor PayPal (NASDAQ:PYPL) tumbled on Thursday, Jan. 31, after the company reported mixed quarterly numbers that left investors unimpressed and unwilling to buy PayPal stock, which was coming off a 20% rally over the past month. From a headline perspective, the quarter wasn’t very good. Earnings topped expectations, but revenues were simply in-line with estimates. That’s a shocker for this company. PayPal normally beats on both the top and bottom line. Indeed, this is the first time in two years that PayPal didn’t report a double-beat quarter. Also, the first quarter guide came in light of expectations, heightening investor concerns that slowing global economic growth is weighing on PayPal. All in all, a glance at the headline numbers makes the drop in PayPal stock seem obvious and warranted. But a closer look reveals that this dip is a buying opportunity. Overall, PayPal’s quarter wasn’t bad. At all. Instead, it was business as usual — and business as usual projects to be the norm in 2019, as well. So long as business as usual persists, PayPal stock will remain on an uptrend and dips will be buying opportunities. It’s easy to look at PayPal’s quarter, see that a 30-forward-multiple stock didn’t double-beat expectations and write off the sell-off in PayPal stock as an overvalued stock suffering from a slowing growth trajectory. But that isn’t what’s happening here. PayPal’s growth isn’t really slowing at all. Total payment volume growth in the quarter was 25%. This figure has run in the 20% to 30% range for several quarters now, so the fourth quarter’s 25% mark is very normal. Also, fiscal 2019 total payment volume growth is projected to be 25% — again, a very normal number for this company. Engagement growth was also stable in the quarter at 9%, while adjusted revenue growth was also stable at 21%. Next year, adjusted revenue growth is expected around 20%, implying year-over-year stability. Margins also held largely stable in Q4, and are expected to gradually expand in 2019. Elsewhere, growth rates actually improved. Account growth accelerated to 17% in the quarter, from a 10-15% range that the metric had been stuck in for several quarters. Venmo volume growth also accelerated to 80%, after being stuck at 78% for two consecutive quarters. Overall, the underlying growth trends at PayPal remain healthy and vigorous. Moreover, management projects those trends to remain healthy in 2019, thanks to a still-favorable economic backdrop. As such, 2019 will be business as usual for PayPal. Business as usual has led to PayPal stock more than doubling over the past three years. It should lead to similar big gains over the next several years. The post-earnings sell-off in PayPal stock has dragged the stock price down below $90. The stock won’t stay there for long. Within the next several months, PayPal stocks should rise toward and above $100. The math here is simple. PayPal has been a consistent adjusted revenue-grower in excess of 20%. This year is expected to be largely more of the same. Growth will inevitably slow over the next several years thanks to the law of large numbers. But, secular growth drivers in e-commerce and mobile commerce will keep growth healthy over the next several years. Thus, this is easily a 15% revenue grower that could hit $36 billion in revenue by fiscal 2024. During that stretch, margins will expand gradually with scale, but will remain largely within the 20-25% range. Gradual margin expansion on top of big revenue growth should propel EPS towards $7 by fiscal 2014. Payment processor stocks, like Visa (NYSE:V) and Mastercard (NYSE:MA), normally trade around 25 forward earnings. Based on a 25 forward multiple, a reasonable fiscal 2023 price target for PayPal stock is $175. Discounted back by 10% per year, that equates to a fiscal 2019 price target just shy of $120. 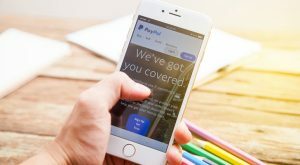 The growth trends underlying PayPal stock remain favorable, mostly due to resilient economic growth and continued expansion of e-commerce and mobile commerce. So long as these growth trends remain favorable — and the valuation remains reasonable, as it does today — PayPal stock will trend higher, and dips are nothing more than buying opportunities. As of this writing, Luke Lango was long PYPL and V.
Article printed from InvestorPlace Media, https://investorplace.com/2019/02/buy-dip-paypal-stock-because-100-next-stop-simg/.